Post your DIY aero pics - Page 13 - Miata Turbo Forum - Boost cars, acquire cats. If the two designs jut the same amount in front of the bumper. The 2nd one will make a lot more downforce while having a bit more drag. It'll make more downforce because it will have a slightly higher pressure above the splitter and because there is just more area on that splitter for the pressure to act on. (pressure is pounds per square inch, have the same pressure but more square inches = more force). Anyone here use OpenFOAM to benchmark their ideas? The second one will not "wear" well and will rip the bumper skin off during the first gravel incident. 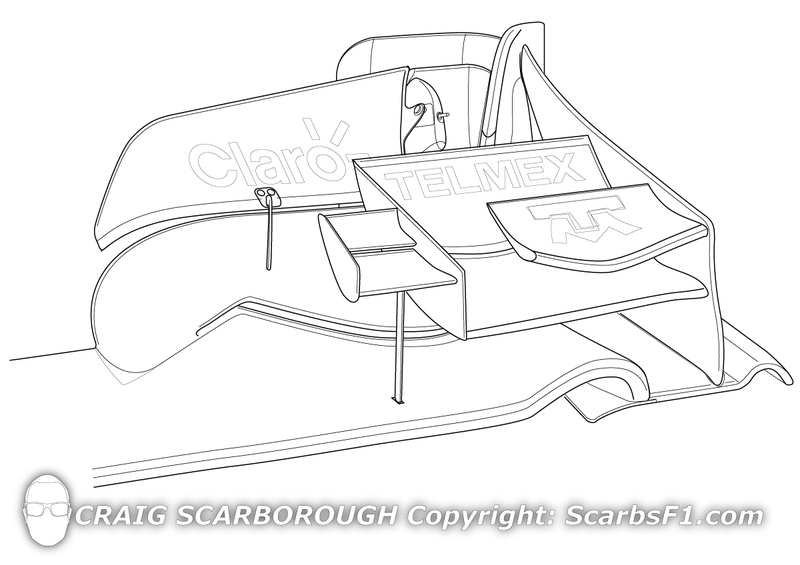 The second one will have more downforce but also more lift because of the forces pushing upward on the underside of the nose as it protrudes. One of the major shortcomings of the stock bumper design is that the bumper overhangs the lowest portion, giving the pressure a point to "lift" against on the underside of the nose. Aerodynamacists caution against this. The one with a straight surface downward from the foremost point is more efficient. The designer obviously built it with this knowledge. Never thought of the upward force. 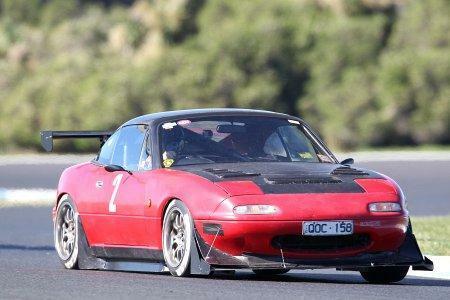 BUT, empirically, at least on an NB1 front end the air dam further back yields more net front downforce. Is Craig your stage name? F1 aero is crazy awesome, and also crazy expensive. But you can use the autoclave to make gumbo. Which means of course NOLA is the perfect place for a US F1 team to set up base. Some say, he is writing the world's first cook book on making gourmet dishes using common hand tools, and that his recipe for Gear a l'Orange uses Motul for the sauce. All we know is, he's called The Hustler. I've used epoxy like the, west systems kit and it works fine. Polyester resin, like the bondo stuff you buy at autozone will melt it. Also, for air dam material, you're basically a moron to not use this stuff. http://www.speedwaymotors.com/Colore...0-Ft,1557.html Enough to make enough air dams for you and all your friends. I finally ordered some of this stuff and got it in this past week. Easily the best option I've found for air dam material so far. I was a little worried that it'd be too thin, but now that I've seen it in person I'm not at all worried. A little over $50 for two sheets to my doorstep = win. I'm definitely buying a roll of that stuff. Pic of my latest low cost aero. Large front splitter, large front diffusers, canards, side skirts that start forward of the front axle line, fastback and dual element rear wing. The car has no mechanical changes (tyres were 2 meetings old last time, this time they are many track days old), just the aero. I picked up 0.9x seconds, with top speed 9mph faster on the straight, and 10mph faster at turn one, now 110mph. Can you elaborate on these two things? Do you have pics of them? I'm assuming the sideskirts start inwards near the center of the body then curve out to the sides of the car? And by front diffuser do you mean a diffuser shape in the front splitter forward of the front tires? Yep, the skirts run along the inside of the front wheel, actually part of the splitter/under tray. Then go around the back of the tyre to meet up to the sides. Front under tray is wedge shaped at the front in the middle. So there is a triangle that is level to the ground. The rest of the under tray is curved up. With sides to create tunnels. I have a cardboard model I made. If I get round to it I will take a pic. I would like to run the front splitter 2" of the ground, the same as the skirts. But I can only just get it on the trailer as is. What spring rates are you running up front? At the length of craftsman deep sockets (bit over 2 inches) off the ground with 900 lb front springs a splitter that does not extend past the body shape will scrape under braking.